For sometime now, I wanted a quite rare SS Casio DW 1000 or DW 1000C watch to complement the Casio W-150/H101 SS Marlin Watch I already had. My intention was to have - as a pair - the first watch that appeared in the famous Casio "Marlin" 100M WR line of watches and also the first watch from Casio SS 200M WR series (with snorkel logo). But it was quite a nice surprise when I found and bought a mint condition Casio DW 1400 which is even much rare and sought after than DW 1000 or even than some famous early Casio's G-Shocks which DW 1000 may be also related to :) (pls read the full story to find why). 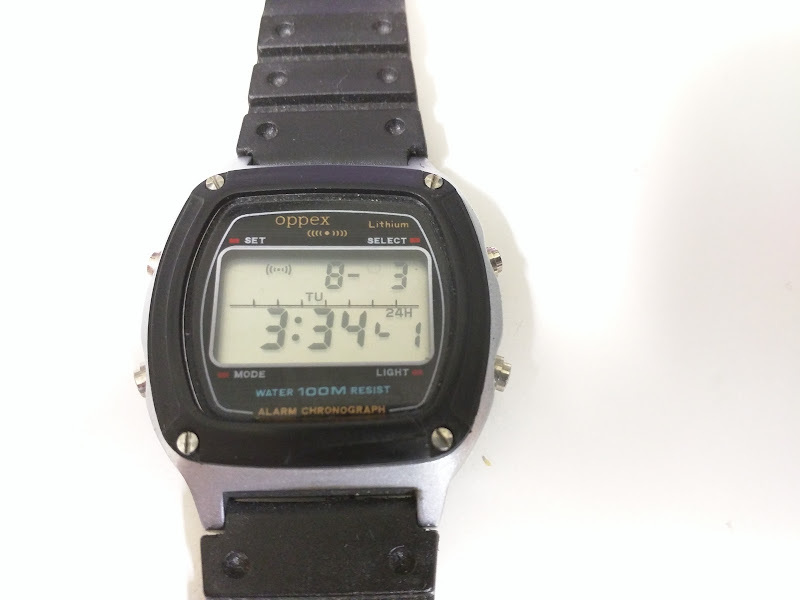 Some reasons because Casio DW 1400 is so rare: it was launched only on the Japanese market and only for about 2 years (1985-1986) as the first Casio watch from the series labeled HD (Heavy Duty), SS, 200M WR! 1. In 1980 Casio launched their first line 100 M WR digital watches, known today as the "vintage" line of Casio's "Marlin". Also interesting, is the fact that is quite difficult to say which watch was the first in this "Marlin" product line, because even if in the Casio's 1980 catalogues W(Water Resistant? )-150/named also H101 on the back plate and with the 106 module appeared as the first, it seems that a W-550 "Marlin" with the module 81 (lowest module number of the entire series) was released in the same time (1980). But this W-550 Marlin watch is so rare and - as a plus - it cannot be found in ANY Casio's catalogue of the time nor in the Casio PINDEX (1993), thus many years collectors were in doubt that it really exist. And it is considered now as one of the "rara avis" watches among Casio''s collectors. It is difficult to find even a proper photo of the W-550, but we are lucky to have Adam's excellent site http://www.digital-watch.com, where one may see that this rare watch really exist :). So, it' may be safe to say that the first commercially available Casio "Marlin" WR watch was the H101/W-150. 2. Following the success of their first 100M WR Marlin line, it seems that Casio was ready to launch in 1982 an entire new 200M WR series entitled Digital Water (DW) resistant. Thus, in January 1982 DW 1000 and 1000C watches - with 280 module - were launched as the first Casio's 200M WR watches of this line. The logo was changed to a snorkler instead of a Marlin/Sailfish, probably to underline the fact that those watches may be used properly for snorkeling and for scuba diving without helium gas. Those watches were also the first Casios that had a "resin bezel" meant to protect the mineral crystal from scratches, one year before the apparition of the famous DW 5000C - the first G-Shock watch! i) Probably to underline to the consumers that their already established and successful "Marlin" 100M WR line of watches is not - quality wise - below the new DW line of 200M WR watches , they have decided to launch in January 1983 a very interesting watch: the DW 200 - who sports a Marlin/Sailfish logo on the face :) while was labeled as being from the DW series, making it the only "hybrid" watch of the 2 families :). To underline even more the connection between "Marlin" and the new DW family, the same 181 module was used either in the 200M WR "DW-200" and also in the 100M "W-650" and 50M WR "W-25" from the "Marlin" logo family. ii) In the same January month of 1983 a new (sub? :) type of watch from DW series were launched, now the most famous and quite rare Casio DW-5000 - WR 200M and Shock-Resistant - with 240 module, that sports a new and innovative "floating module design" inside the resin bezel, a design imagined by Casio's young designer Kikuo Ibe and labeled also "G-Shock". and because of this similarities Casio DW 1000c is considered by many experts and Casio collectors - e.g. Casionerd, as "the father of G-Shock"
and the DW 1000/c appeared in many "G-Shock history" materials as the G-shock line main precursor. - A watch - DW-1400 HD - module 280, SS with resin bezel/ring very similar with DW 1000 (probably meant to replace it), labeled HD (Heavy Duty) on its Blue dial. But the first Heavy Duty oriented watches (but not labeled HD) were the first G-Shocks, at least according to the 1984 Casio catalogue!!! So, the DW-1400 is probably the FIRST Casio HD (Heavy Duty) labeled watch, also 200M WR!!! - 1 watch from the DW 5000/G-shock line with a different case design than the DW 5000/5100/5200C - the famous and now rare as hen's teeth G-Shock 5500C watch!!! Last edited by cybr on 16 Dec 2015, 00:54, edited 1 time in total. What a great article. Thank you for sharing that information. I really enjoyed reading it. Thanks Mr. Adam for your kind words. Glad that an expert like You enjoyed that short (hi)story. Meanwhile, I've added also the module numbers for DW-1400 (the "old school" 280 module) and DW-1100C and DW-1200C (both with the new 548 module). This may be one more argument to consider the DW-1400 as the first Casio's HD labeled watch, even if it was launch in the same month with the other HD watch, the DW-1200C, but this later one has the new 548 module installed :). And a Merry and Happy New Year to You and all the friends from newdwf.com!